September brought rain to Georgia and lots of it! At first, people were excited. Our lakes and rivers were replenished and our gardens and farms were happy, but then it kept raining… and raining… and raining. Georgia suffered severe flooding, which caused damage to people’s homes, cars, businesses and even families. Among those affected by these horrific floods was a group of small farmers who lost their crops, structures, equipment, precious topsoil and livestock. The Whole Foods Market stores in Georgia knew we had to do something – these farmers are our friends and an integral part of our local food community. All seven Atlanta stores rallied together to hold a Metro-Wide 5% Community Day on Wednesday, October 21st, to benefit the Georgia Flooded Farms Relief Fund in partnership with Slow Food Atlanta and Georgia Organics! Three stores also held parking lot farmers’ markets where over 30 unaffected local farmers and food artisans sold directly to consumers and donated a percentage of their sales to the Relief Fund as well. Here is just a small sampling of the great folks who joined us: Will Harris from Harris Family Heritage Farms, Nicolas Donck from Crystal Organic Farm, and Hal and Drew Ambos from Ambos Seafood! Wednesday was a huge success and raised a grand total of $23,939! Our National Produce Office also contributed a gift of $500! Our stores are also holding a Donate-Your-Dime campaign for the entire month of October where you can choose to donate your $.10 reusable bag refund to the Georgia Flooded Farms Relief Fund. So far we have raised an additional $3,285 but we aren’t done yet. You can still take part: Donate-Your-Dime will continue until October 31st in all seven Atlanta locations. Want to do more? Slow Food Atlanta has set up a page providing lots of information about the farmers and you can donate directly through their site to the Relief Fund. A huge thanks to all of our customers who have come through and helped these farmers in need. 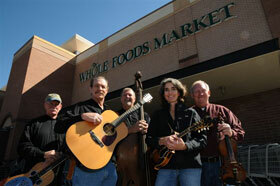 Emily, a yankee-born converted southerner, joined Whole Foods Market in 2002. She devotes her free time to raising a daughter, and tending to a flock of 8 chickens and a backyard garden in the suburbs of Atlanta with her partner, Michael. With food and other items that are free of pesticides, preservatives, sweeteners, and cruelty, Whole Foods Market knows more about guiltless eating and shopping than most retailers. The world’s #1 natural foods chain by far — now that it has acquired its main rival Wild Oats Markets — the company operates some 275 stores in the US, Canada, and the UK. The stores emphasize perishable products, which account for about two-thirds of sales. Whole Foods Market offers more than 2,300 items in four lines of private-label products (such as the premium Whole Foods line). Founded in Austin, Texas, in 1980, Whole Foods Market pioneered the supermarket concept in natural and organic foods retailing.